Brussels sprouts' taste and smell can be bitter or delicious. The secret is in how you prepare them. If you're using fresh Brussels sprouts, (and you really should) trim off all remaining portions of the stem as well as any discolored outer leaves. Wash well under running water or soak for a few minutes in a bowl of fresh water, then rinse. Before cooking, cut an “X” in the bottom of each sprout to ensure that the heat spreads evenly. Microwaving or steaming will preserve the sprouts’ texture and color. Cook until the Brussels sprouts are bright green and just tender with a little crunch, usually 4 to 8 minutes in a microwave or 8 to 10 minutes in a stovetop steamer, depending on size. Baby sprouts often have a sweeter taste than full-sized and are available frozen. Add a sprinkling of chopped pecans and dried cranberries, plus a dash of balsamic vinegar and a touch of olive oil; add salt and pepper to taste. Toss before serving. Roasting also works well for Brussels sprouts. The oven's dry heat works to evaporate the liquid from the sprouts, making them pleasingly firm and creamy-textured while caramelizing their natural sugar for a bit of sweetness. 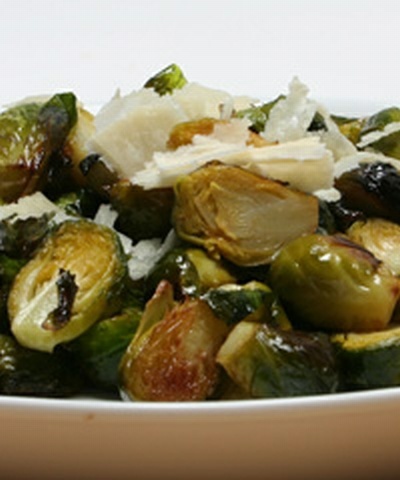 Toss the sprouts with some olive oil and roast for about 25-30 minutes in a 400-degree oven on an oiled baking sheet. When done, spritz with fresh lemon juice and top with a spoonful of freshly grated Parmesan cheese or a sprinkle of nutritional yeast before serving. Combine first six ingredients in blender and blend just until puréed. Transfer to a nonstick saucepan. Bring mixture to a boil, then immediately reduce heat to moderate. Cook, stirring frequently, until sauce is slightly syrupy. Check taste and if glaze seems too acidic, stir in slightly more honey. Add salt and pepper to taste, if desired. Reduce heat to low and set aside. If using fresh sprouts, steam 8-10 minutes on the stove, covered, over 1 1/2 cups boiling water (or 4-5 minutes in a microwave oven on a plate with 1/4 cup water). Per serving: 70 calories, 1.5 g total fat (0 g saturated fat), 11 g carbohydrate, 2 g protein, 3 g dietary fiber, 25 mg sodium.